This review is from point of view of someone who has never read Ze Tian Ji/Way of Choices novel nor has seen any Live Action adaption of the same. The story starts pretty slow i.e. pacing is slow in initial episodes. I thought of giving up on this but then realized that this is not an action heavy anime. This is more of a Fantasy Drama. Story is quite interesting along with the MC, Cheng Chang Sheng. Have patience during initial episodes. Story will pick pace during ending episodes. If you are expecting the MC to be OP then this anime is not for you. MC is a genius, thats all. Doesn't have any special power or hidden talent. I'll recommend watching this series for its story. Animation is bit old (nothing too flashy, enough to convey the story). 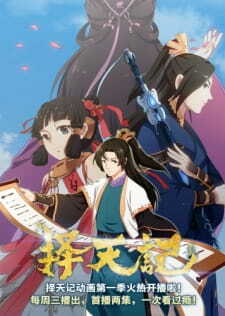 Best part are the OST of the anime which reminded me of old Chinese dynasty fantasy films I used to watch. Overall, I'll recommend this series for its story and people who are interested in fantasy and drama genre. The fast pace is good considering the original and live action had pacing problems but not much content is covered at all. The series hits a thankfully climatic scene but only covers beginning arcs. The adaptional changes do seem odd, but don't hit unacceptable as the live action did. They start to add up towards the end but so long as the future characters and arcs are preserved I wouldn't mind the few changes. The art itself isn't bad, the animation lacks a little in quality, passable most of the time but early action scenes suffer, there is a noticeably stronger effort towards the end. graphically speaking the characters are well done, the effort put into background and extra characters is also appreciable. The few minute 13 episodes it got doesn't do the original justice but it does effectively display what it does cover. its nice that it got a second season but it's yet much better then the other adaptions. How is it that something animated has worse props then the live action? ?